OK, I know how it is. After the first few years, after your martins leave, you kinda loose the excitement of cleaning out those dirty gourds and house compartments. I guess it is one of the less glamorous aspects of playing landlord to a couple hundred or so odd birds every year. Even though I know better, I find myself again putting off the dirty task. Heck, my birds will be headed back in only a couple of months! What is the big deal, you ask. I know for a fact that there are plenty of folk, good and decent folk, that don’t touch their purple martin houses or gourds from one year to the next. You may be one of those people. You watch from the sidelines and enjoy the view in the spring and come fall you walk away. Nothing wrong with that…unless you want to be taken over!!! Here is my lesson learned from last summer and the reason why I WILL finally get to my gourds this week. I promise! 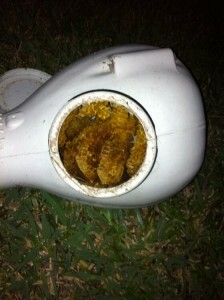 The bees simply loved the gourds and made quite a nice hive. The paper wasps like to make a home in there also. The solution is simple. After cleaning out the gourds I just cover each gourd with a tall kitchen garbage bag and they sit clean and protected from all sorts of non-purple martin wildlife. You can take all the houses down if you have the garage space or you can plug the entrances with door shields or plugs. Beware, if you use door plugs, look for air vents that you may also have to plug that are large enough to let in creepy crawlies or stinging friends. And if I don’t…well, I deserve what I get! Our last blog post touched on one of the reasons that purple martin nestlings jump prematurely out of their nests. Referred to as “jumpers” these youngsters are often doomed. The reason why I, along with many other South Florida landlords, have seen a huge increase in jumpers this year over previous is our record breaking drought conditions. Dry weather means fewer bugs which means purple martins go hungry and nesting success plummets. The main reasons that martin landlords encounter jumpers are: parasites, extreme heat and hunger. Drought, though not a specific reason, contributes to low food supply and hunger/malnourishment. Parasites can torment young inside a nest. Though some have argued that nature should be allowed to take its course, the natural instinct of the Purple Martin (Progne subis, subspecies: subis) has been altered by man. Before Native Americans created the tradition shift in martins, the nest sites of these birds were tree snags and they nested farther apart. 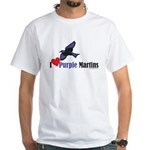 You can read about some of the history of martins at our parent site: PurpleMartins-R-Us.com. They were much like their West coast cousins, Progne subis, subspecies: hesperia and subspecies: arbicola. The shift not only affected were they nested (tree snags vs man made houses) but the way they nested, as it is believed they were not as colonial in their nesting. That is to say, they were spaced further apart and did not nest in such large groups. The groups of martins nesting in close proximity can create parasite population explosion. 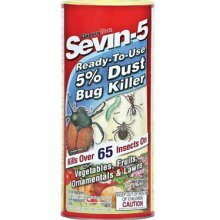 We counter this by periodic nest changes and/or the use of a small amount of Sevin. We have a great link to a video on how to do a nest change. Extreme heat in a nest can be challenging to combat but if not associated with drought or food shortages, are usually easy to remediate. By making sure all vents are open in nest compartments and gourds, air circulation can be increased which can help lower temps. Many artificial gourds have vents that can opened as an option. For example Troyer gourds have built in mini vent canopies that can be drilled open easily. We recommend drilling these open before the season but a cordless drill can open those up quickly. 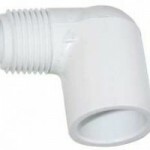 If those are too small or you want larger vents (more air circulation) than a 1/4 inch threaded PVC elbow (90 degrees) is perfect for the job. 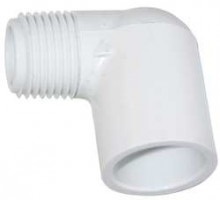 It can be easily installed on any gourd or house for that matter to increase air flow. Just drill a hole large enough to thread the end in and caulk in place. Make sure it points down and, if you want, attach a small piece of screen to cover the opening to allow air in but keep wasps out. 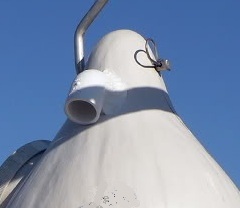 The picture shows a modified gourd with elbow in place at the highest point which will push out the hot air as it rises. Know that in Northern climates you may have to plug these vents inn the early spring in times of cold weather to keep your martins warm. Using a frozen gel pack placed in an empty compartment. A frozen bottle of water can be used also. A secondary shade can also help. Placing a sunshade to keep the sun from beating down on the house surface can decrease temps. Even a misting system has been used by many with success. Just makes sure the water does not go into compartments which would lead to wet nests. Also the misters should only run intermittently in the hottest part of the day so that the water can dry off. The evaporation is what cools. Don’t let the misters run at night or continuously. 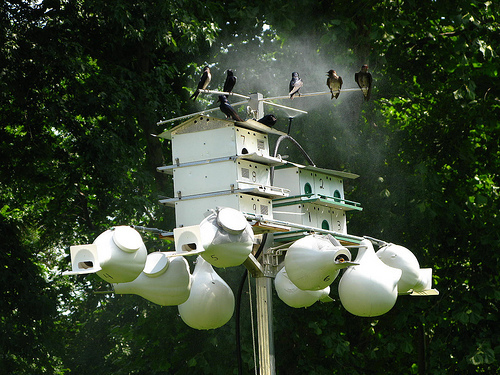 Our Free Purple Martin House Plans page has instructions available on how to make a mister system for your martin houses. Hunger is a difficult problem and the debate is heated on how much humans should intervene on this. Though supplemental feeding is often done in early spring cold snaps for returning adults, one should strongly weigh the consequences of feeding purple martin nestlings. Remember that if you have several nests that are doing poorly from lack of food, the parents are suffering also. If there is a long term problem, supplemental feeding is a very short term solution. Read our Emergencies page for first responder care of purple martins. What other problems lead to Purple Martin nestling Jumpers? Let us know what you think. Like our blog? Subscribe to our RSS feed, or “like” us on Facebook! Time after time, this season, I have received calls from landlords concerning dead purple martin nestlings. I myself have found several jumpers this season. Jumpers are nestlings that are far too young to fledge but jump out of their nests for whatever reason. Usually extreme heat, hunger or parasites are the culprits that lead a martin nestling to such a desperate act. I liken it to people trapped in a high rise that is ablaze. The victims jump to their death to escape the fire. This year South Florida is suffering from record drought conditions. In droughts flying bugs are significantly decreased leading to catastrophic food shortages. Nothing but rain can re-establish the equilibrium of the food chain. Since our weather is usually fair, our population of purple martins is not familiar with supplemental feedings. In some emergency situations like extreme cold, purple martins can be trained to accept food from an elevated tray or Bed & Breakfast type feeder. Unfortunately, when the weather is fair enough to fly and catch some bugs, the birds will just forage longer and farther from the nest. So training them to accept feedings is extremely difficult. To see a video of supplemental feeding of purple martins click here. In the usual activity of a purple martin nest you will see some of the nestlings at the entrance waiting to be fed while others are sitting in the back of the nest resting. As the ones in front are continuously fed and get full they turn around and retreat to the back of the nest to sleep, digest and grow. The nestlings that were resting and digesting then get hungry again and come back to the front of the nest to take their place at the entrance to wait for a mouthful of bugs. The nestlings are in a continual carousel of being fed, keeping the parents busy feeding a nest full of an average of 5. But when the nestlings are not getting enough food then they all cluster at the front. So these “jumpers” can actually be accidentally pushed out by the jostling of the babies at the entrance for food. Martin nestlings that jump due to starvation are usually doomed as the accompanying dehydration is far more deadly than the hunger. Since all purple martin nestlings water intake comes from the insects that the parents bring, in cases like this the jumpers are all very dehydrated. Not wanting to sound like a pessimist, there is not much that can be done. Feeding a dehydrated and malnourished nestling can cause it to just die faster. Looking at the jumper you can often see clues as to how well fed they are or are not. A pronounced keel (breast bone) shows lack of muscle development from chronic malnourishment. Dry, flaky skin is a sign of dehydration. 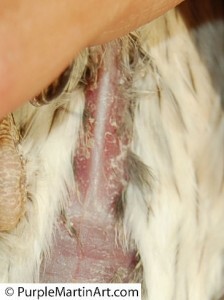 A wildlife rehabilitator would also look for signs such as skin turgor or “tenting” of the skin as a sign. Emergency injections under the skin would then be given BEFORE any feedings would be attempted. Water or other liquids can aspirate and kill birds quickly if given by mouth. This article on Hydration of Purple Martins can answer some questions and prevent more harm from being done while a rehabilitator is contacted. If their are other nestlings in the nest sometimes the weaker nestlings “jumping” can increase the survival rate of the nestlings left in the nest. If the jumpers can be hydrated then fed by a rehabilitator, they can often be reintroduced into the nest when the are approaching 21 days old before they fledge. Nest checks become increasingly important to know the age of the nestlings. As lowering housing may sometimes cause fledglings to prematurely fledge out of fright. Though we provide housing for these wonderful birds, one can’t feel responsible for acts of nature such as drought. We help as best we can and give them a chance to survive. Next year they will return and hopefully with better weather conditions. We learn from our experiences and the next season will bring another chance at life. Look out for our next entry on some of the other causes of “jumpers”.